Namibia's premier wildlife sanctuary, the Etosha Pans. In Northern Namibia is situated one of Southern Africa’s finest and highly treasured wildlife sanctuaries: The Etosha National Park. 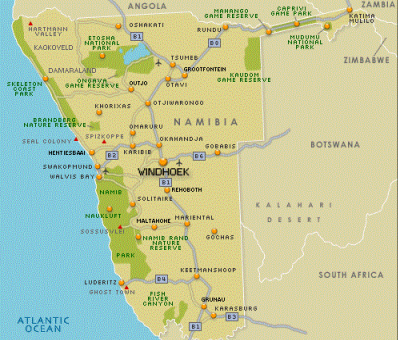 Proclaimed in 1907 as national park, make this National Park one of the oldest in Africa. Over a hundred years of good wildlife management by Conservation bodies and government's, has given the world a wildlife sanctuary not easily equalled. Etosha, which means "great white place", is centred by a enormous mineral pan. About 10 million years ago, the pan was fed by the Kunene River, and in time the flow of the river changed and the lake dried out. For the past centuries, the pan is now a large shallow depression of mineral salt clay, which only fills up if the rains are very heavy, or as in the past few years, the Kunene River burst it's banks to spill into the pan. This this temporary flooding of the Etosha Pan only last for a few months, as the heat, wind and natural evaporation dry the Pan out fast. But, when flooded, attracting thousands of water birds, as well as spectacular flocks of flamingos. The Etosha National Park delivers exceptional game watching in one of Africa’s best safari countries. What make this National Park so special is the amazing natural wildlife diversity. Herds of Springbok, Wildebeest and Zebra are spread across the almost endless golden savannahs, while the numerous waterholes entice rare animals to their waters, offer the visitor an wildlife viewing un-equalled in Africa. Ø Etosha is a 22,750 km² wildlife haven in Namibia – Africa’s most stable and peaceful countries. Ø Spectacular wildlife viewing during the dry winter season, from May to September. Ø One of the very few places in the world that it is nearly guaranteed to see the endangered black rhino. Ø All the safari camps in Etosha, the waterholes are flood-lighted at night, for night-time game watching. Ø The Park is accessible to normal 2-wheel-drive vehicles. Ø Etosha is also a malaria free zone, and ideal for family safaris. Ø There are three well-facilitated rest camps within the park: Namutoni, Halali and Okaukuejo. Ø With a variety of quality private lodges on Etosha's borders, provides guests a wide selection of safari accommodation choices. Ø Visitors to Etosha could count on to seeing a diverse range of antelope species, giraffe, elephant, rhino and lions. Ø The road network connecting the five camps and numerous waterholes are extensive, and generally in very good condition.